Let’s put the heating on for a few hours. What time does the heating come on in the morning? It’s too hot in here, can we turn down the heating? It was time to brave the rush hour traffic again. Let’s brave the snow and go for a walk (= go for a walk even though it is snowing). He braved the anger/wrath of his father by quitting law school and becoming an artist. Rain in the morning will turn into snow during the afternoon. Our holiday turned into a nightmare. His first novel was turned into a television film. Icicles hung from the roof. He’d expressed a wish to go there. Did he express any wish to see me? 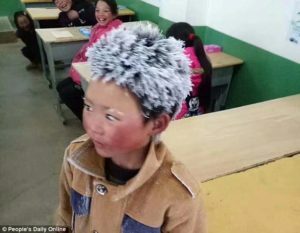 A Chinese schoolboy’s fate has caught the attention of millions of people after a picture of his icicle hair became widely shared online. 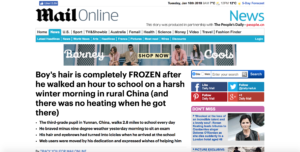 The child, from rural China, had just spent more than an hour walking 4.5 kilometres (2.8 miles) to school on a harsh winter morning, according to reports. Wearing a thin layer of clothes, the boy braved minus nine degree weather to sit an exam yesterday in a small town in Shaotong, southern China’s Yunnan Province. The refugees have suffered an appalling fate. His fate is now in the hands of the jury. Dave’s doing his Accountancy exams next week. American students ranked fourth in those taking the geography exam. The boy is said to be a third-grade pupil at the Zhuanshanbao Primary School in Xinjie Town, Ludian County, reported People’s Daily Online. He comes from a less-fortunate family. His father is a migrant worker in another city and his mother has abandoned him and his father, according to Pear Video. 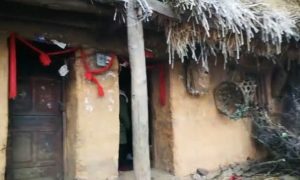 The boy is named Wang Fuman and is eight years old, according to Pear Video, lives in a bare mud house in Ludian with his grandmother and his elder sister. 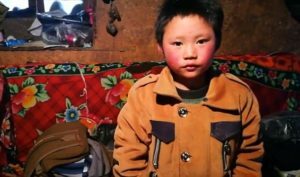 The headmaster of the school, surnamed Fu, said the child’s home is far from school and he spends more than an hour walking to school every day. His classroom does not have heating. Not everyone is as fortunate as we are. The state provides textbooks for the less fortunate students. The cities are full of migrants looking for work. The UK needs migrant workers to plug skill gaps in sectors such as agriculture, hospitality and food processing. The programs provide multiple services for the migrant population, including education, and training to learn new skills. Headmaster Fu said the school’s final examinations started yesterday, but the temperature plunged to minus nine degrees suddenly in the morning. As a result, the boy’s hair and eyebrows were completely covered by frost when he arrived. Apparently when the boy’s 16 classmates saw him entering the classroom, they giggled at his funny looks. The boy didn’t seem to be bothered by the adverse weather either. ‘The child is cute. He pulled a funny face to his classmates,’ Headmaster Fu said. According to the headmaster, the boy is a hard-working pupil with a particular gift in mathematics. When I woke up this morning, the ground was covered with frost. There was frost on the grass in the early morning. Mike pulled a face at the food and took his plate over to Helen’s table. I was making silly faces to get the baby to laugh. “This tastes horrible,” said Tom, pulling a face at his glass. Making quick decisions is not one of my greatest gifts. She gets her gift for languages from her mother. He has a gift for music – he plays the piano and sings beautifully. 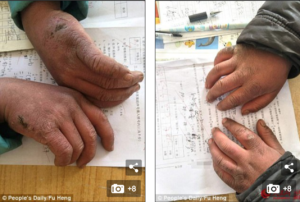 A picture taken by People’s Daily shows the boy putting his cracked hands against a marked examination paper. The examination paper said the boy had achieved 99 per cent in maths. Fuman told a reporter from Pear Video that he got frostbite on his hands because he had to help his grandmother do farm work. He also said he hadn’t seen his father for a few months and missed him a lot. After seeing the boy’s picture online, many Chinese web users were moved by his dedication to studying, and expressed wishes of supporting him. Some older people lament the loss of close local communities. The poem opens by lamenting (over) the death of a young man. My grandmother, as usual, lamented the decline in moral standards in today’s society. He lamented his students’ lack of interest in the classics. The town is increasingly prosperous. Lots of microchip manufacturing companies prospered at that time. As the company prospered, we prospered.